My god this game is AMAZING! I've barely just started playing and I'm enticed! I started as a scout and while the first cave felt a little open ended, it got really good once I reached the cross way and the Blue fang cavern, I just started the (what I think at least is) first dungeon and I don't feel overwhelmed. The shooting star is an amazing first weapon and it's projectiles aren't broken nor crippled thanks to the level design, while it seems some terminals can't be accessed. I'm having a blast going through and using my prior Cave Story knowledge to get past certain obstacles and gather things like life-capsules. I'll play more later and this is a mod I'm definitely coming back to see! Keep it up! Keep on mapping! It was pretty enjoyable, exploring those long sprawling maps. I liked the level design, the beta monster/world look. Music was a nice change of pace too... Very ambient in comparison to typical CS music. Though if I get stuck I bet I'll fall asleep to the music lol. 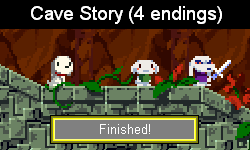 These days I'm all about the story, since you rarely see new enemy/boss patterns in Cave Story. But, just exploring the well decorated world was pretty enjoyable. If you can add more new sights and graphics, more new surprises (and some NPCs?) things are looking great. If there ends up being a story, I would love to see some major dialogue differences depending on the character chosen... ribbit. Ugh, sorry about the 'got item' jingles restarting the music. It's so much worse with atmospheric music. Hey, no problem. Always ready for a fix. I'd like to make some custom fanfare jingles in the future as well. Thanks! I'm looking forward to making more maps. I find it to be better to focus on gameplay/exploration first rather than trying to muster up a storyline and restrict myself with it. It is a bit too early to make a story I feel, but whenever there is an open chance to do it, I'll probably put in some side quests. We'll see how things play out. Great to hear! There's alot of work to be done, but surely there is enough content in this version to get a decent understanding of what the mod is all about. I enjoyed this mod very thoroughly. For a first release, this mod has an incredible amount of polished content. I absolutely love the atmosphere of this mod. The 60 fps hack, music, and level design all together set a very fresh tone that you don't normally feel when playing a Cave Story mod. The sound effects were really cool sounding as well. As far as the art and music goes, my only complaint might be that it seems like it would have been fitting to have different "Get Heart Tank!" and "Got Item!" music, because the original counterparts don't fit very well with your customized look and feel. About 20 minutes in, I realized that the aspect ratio is 16:9, which is totally awesome, because that would make it fit with most screens these days. Much to my disappointment, the full screen feature doesn't seem to quite work, no matter what I try with DouConfig. I really liked how you used familiar hacks in a way that didn't feel forced, and smoothly weaved in new hacks that we haven't seen much before; it was a huge breath of fresh air from most assembly gimmicks that exist simply to show that it can be done. The level design overall was excellent, and the exploration was both intriguing and rewarding. I thought it was cool how you can choose different characters at the beginning with different abilities, but based on what I can tell, it seems like there's not much of a point in selecting anything other than the scout, given that the others don't have any substantial advantages (the closest one being to breathe under water, but that's insignificant next to more health and a booster). I could be mistaken on this, I didn't look into this too much. I sort of reached a dead end in my exploration after I beat the second boss (the shinier Balrog). All the unexplored territory was mostly doors that didn't have events assigned to them, which I'm assuming means I reached the end of this demo. -Whenever having a chest for us to open, it's best to use a <PRI command to pause the game instead of a <KEY command, because with the latter, enemies can get to you while you're reading the text boxes. -That first balrog-like boss was pretty epic, and the music and flow of it was really cool, but it was very poorly balanced, full of fake difficulty, and frequently causes the player to rely on luck. Giving the gun limited ammo down to 5 was a cool part of this mod (as was the quarduple firing if it doesn't hit a wall), but I think that the player gets nerfed just a little bit too much. Shooting away all of the projectiles emitted by the boss and not getting killed requires some extremely precise strategy that doesn't so much require skills and reflexes as it requires developing a boring and tedious strategy that abuses the boss' fight patterns. The end of the second phase is pretty much impossible to power through without getting killed unless you have your gun still at level 3 and the boss just so happens to be at the far end of the room such that you're not immediately cornered. I also think the 3rd phase (the Pooh Black resprite) is not very well balanced with your health. Dodging those projectiles when the boss is about to descend often depends on luck more than reflexes. Perhaps others will disagree with me, but this made me come close to losing interest in this mod, and I ended up modding the game to get through this part. Overall, you did a really good job on this mod, and definitely put a lot of time into working out most of the bugs. I hope to be able to play the next release. -That first balrog-like boss was pretty epic, and the music and flow of it was really cool, but it was very poorly balanced, full of fake difficulty, and frequently causes the player to rely on luck. Giving the gun limited ammo down to 5 was a cool part of this mod (as was the quarduple firing if it doesn't hit a wall), but I think that the player gets nerfed just a little bit too much. This makes the boss battle harder than I think it should be. Shooting away all of the projectiles emitted by the boss and not getting killed requires some extremely precise strategy that doesn't so much require skills and reflexes as it requires developing a boring and tedious strategy that abuses the boss' fight patterns. The end of the second phase is pretty much impossible to power through without getting killed unless you have your gun still at level 3 and the boss just so happens to be at the far end of the room such that you're not immediately cornered. I also think the 3rd phase (the Pooh Black resprite) is not very well balanced with your health. Dodging those projectiles when the boss is about to descend often depends on luck more than reflexes. Perhaps others will disagree with me, but this made me come close to losing interest in this mod, and I ended up modding the game to get through this part. Overall,you did a really good job on this mod, and definitely put a lot of time into working out most of the bugs. I hope to be able to play the next release. Thank you for your input! It was a fun and energizing read. I liked how thorough your review was, both on a positive and critical level. Addressing the issues, ouch! I forgot to fix that textbox. That'll probably be the first thing I fix next time I pick the mod back up. You're definitely not wrong with your statements on the boss battles, and while they are from your own perspective, I feel that some of what you mentioned is pretty solid from a potential objective standpoint. The boss battles are certainly not very fun, even for me on some characters with non-piercing weapons such as the Scout. This is something I want to revamp for the next release, and perhaps the only things I'd want to change in this dungeon and some several bugs/design issues before I pack my bags on it. A couple workarounds I thought of is changing the health values around or something. Ive had some playtesters that shared some distress about the "gauntlet-rogs". Thanks again for your review. I'm thrilled to showcase the next release whenever it happens. 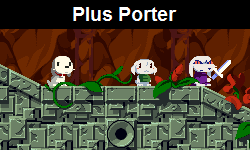 This may be one of the best Cave Story mods I've ever played. EDIT: In the blue fang depths there is an "eye door" enemy, and you can enter the door before you kill it if you're fast enough. When you walk back in through the same door you take damage. somewhat surprised people are finding the bosses hard - I actually thought they were almost a bit too easy and the gauntlet was easily blitzed by the missile launcher. I played as Mimiga so maybe my selection was easier than others. I still enjoyed to mod a lot but the main issue personally was the Balrog bosses. As the scout you're only given the Shooting Star (A cooler Polar Star). The Balrog gauntlets are hard with it, you start with 5 ammo, granted it regenerates and I've only found a max of 12 hp, so getting to the Pooh Black Balrog was hard enough, and it didn't help that the 2nd Balrog Gauntlet had the Labyrinth Balrog as a 2nd phase, it wouldn't be an issue except as the scout you do 6 damage max with maybe 12 - 24 damage per second and Balrog fight 5 (in the first dungeon might I add) doing 5-10 damage, you don't fight that Balrog with 10-12 hp, you usually fight him with 36-41 hp. I suppose it's a lot easier if you take the path to the right and pick up the missile launcher and level it up a bit before tackling that boss. I feel like it's an intentional part of the nonlinear design however in cave story mods we're used to a very linear progression so upon reaching an obstacle it's natural to get hung up on it. Perhaps once the play area has grown more the nonlinear approach will be a bit more intuitive. That's interesting that Noxid didn't find the boss so hard, potentially due to the fact that he played as the Mimiga. I wasn't aware of the advantages the Mimiga had. That, and I never did find the missile launcher, so that's a big help. Either that, or Noxid has mad skills, which I guess I shouldn't be too surprised by. One thing that you could play around with that would be really cool would be if you designed certain bosses such that some will be particularly easy to beat with certain characters, and noticeably harder with others. Like an enemy that's only vulnerable under water, and the frog has the advantage of hitting it more easily. Or a boss with an attack that's relatively easy to dodge if you're the scout and you have the booster. In any case, based on what I'm hearing, it sounds like it would have been possible to get the missile launcher before facing that first boss. If so, I would recommend making it more conspicuous so that it's harder to accidentally skip getting the missile launcher before facing that boss. That might make the scout battle with it more bearable, if tweaks to the actual battle itself are not as feasible. I can agree with most of the Balrog boss complaints. When I got to it I only had 5HP and I didn't kill the eye door enemy, so if I tried to go back I instantly died. I had to beat all of them with 5HP, and it was hell. I ended up quitting after I could never beat Puu Black. Gonna restart as a Mimiga and see if it's easier. What i could do is add more elements to signify that there is an easier way to tackle the gauntlet with the assistance of the rocket launcher. The dungeon layout isn't supposed to be linear, however I may have to refuse the idea of replacing the doorways and implement something else to work around it. No idea tbh. I can't go back. I didn't kill the eye door enemy in the previous room so if I try and leave it instantly kills me. How about something like the old Legend of Zelda? Each dungeon had its own map and compass hidden in the level... The map obviously reveals the level design. But the compass reveals the position of the boss. And if you wanted the player to be in the dark when they first enter a dungeon, you could silently replace the map item when entering, with a false duplicate map item that requires some event before it starts working. Maybe a rest area with a computer in every dungeon? Or after fighting your first mini boss? 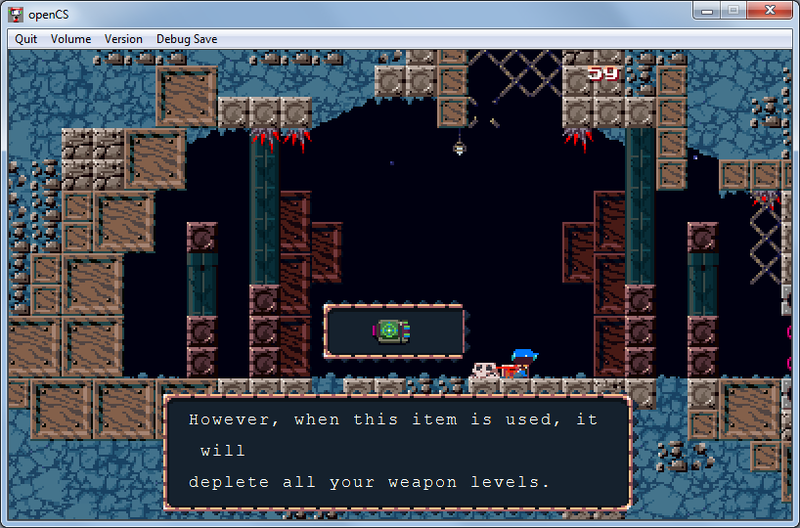 I very rarely use the Cave Story map item... ever. But, if you took the time to make it more integral to the player's survival... Or at least made it obviously useful to those who want a heads up of where they should avoid until prepared or where to search for an item... (You could remove or add symbols by editing the map tiles through TSC, though tedious.) You could even disable the map item while in the dungeon, and use a rest area computer to display area information. Though honestly, hinting to the player about the existence of an item/providing visual cues that something dangerous is nearby (Which you did already? With the missile expansions that couldn't be accessed ahead of time, and the suspicious looking room or chest that looked dangerous...) should be enough? Interesting ideas. I'll have to tinker and experiment with some methods to make the map system more viable, since that will be an item that will prove it's worth and use for the mod. It would be pretty cool to make some blinking skulls on the map system or something, but my knowledge with tinkering in ASM is pretty braindead. The "Eye doors" might be the entities to base the signals of where the bosses are. I like the idea of having a "Map room" for the dungeon, where it can survey where most important boss rooms are located and provide map data. Regardless of what I'm saying here, the map system will be more of a surprise for the next version. My development process is less planning, and more improvising. I'll come up with something whether it may be this or something else; whatever benefits the player most. Also, I'm reading that Cyber got himself locked. Bad stuff. I'll have to make some edits to those eye-doors soon so that they don't potentially lock the player into the room by making that mistake.